The juvenile justice system in Texas is a hybrid system which incorporates major elements of the adult criminal system, while maintaining separate rules and procedures to ensure that juveniles are not treated or labeled as criminals. In keeping with this philosophy, there are some special rules that apply when police officers take statements from juvenile suspects. This article will explain these rules and when they apply. There are two types of statements: those taken as a result of custodial interrogation and those that are taken without custodial interrogation. There are different rules that apply, depending on which type of statement it is. Historically in America, confessions have been looked at cautiously. This is because the police interrogation process has always been thought to be coercive by its very nature. The primary concern when viewing a statement given by a suspect is voluntariness. Therefore, no statement can be used in court unless it was voluntarily given. This voluntariness requirement applies to juvenile statements too. For noncustodial statements, voluntariness is the only requirement. When looking at whether a juvenile statement was voluntary, the courts look at the totality of the circumstances. This means that the court will evaluate the situation including a child’s age, experience, background, education, intelligence, and their capacity to understand their rights and the consequences of waiving them. If, after considering all of the relevant factors in a particular case, the court determines that a noncustodial juvenile statement was voluntary, then it will be admissible in court against that juvenile. A police officer that takes a juvenile’s statement as a result of custodial interrogation must not only ensure that the statement was voluntarily given, but also must comply with specific rules set out in the Texas Family Code. But first, you must ask two threshold questions: (1) Was the juvenile in custody? and (2) Was the juvenile being interrogated? (1) Was the Juvenile in Custody? Texas Family Code Section 51.095(d) considers a child to be in custody if he is in a juvenile detention facility, is in the custody of a police officer, or if he is in CPS custody and suspected of engaging in delinquent conduct. The Texas Court of Criminal Appeals decided that “in custody” means when a reasonable person, under the circumstances, would believe that his freedom was restricted to the point of a formal arrest. See Dowthitt v. State, 931 S.W.2d 244 (Tex. Crim. App. 1996). The Texas courts use a “reasonable innocent child” standard when looking at juvenile cases. See In the Matter of L.M., 993 S.W.2d 276 (Tex. App.—Austin 1999). Juveniles are not in custody, in the eyes of the Texas courts, when they are told by police that they are not in custody and are free to leave and at the end of the interview they are actually allowed to leave. See In the Matter of V.M.D., 974 S.W.2d 332 (Tex. App.—San Antonio 1998). (2) Was the Juvenile Being Interrogated? If a child is in custody at the time a statement is taken, then you must look to see if the statement was the result of interrogation. The United States Supreme Court ruled that interrogation includes any questioning by a police officer and any speech or actions that are reasonably likely to get an incriminating response. See Rhode Island v. Innis, 446 U.S. 291 (1980). If a child is in custody and interrogated, then special rules must be followed before his written statement will be admissible in court. These rules are laid out in Texas Family Code Section 51.095(a)(1). Before a juvenile in custody is interrogated, he must first be taken to a magistrate. The magistrate must advise the juvenile of his rights without the police officer being present. After being warned of his rights and agreeing to waive them in front of a magistrate, the child can then be questioned by the police officer outside of the magistrate’s presence. He can write a statement if he chooses. Before the juvenile signs his statement, however, he must be taken back in front of the magistrate. Without the police officer being present, the magistrate will review the statement with the child and determine if he understands the statement, voluntarily gave it, and voluntarily and intelligently waived his rights. Once the magistrate makes these determinations, the child can sign his statement in front of the magistrate. 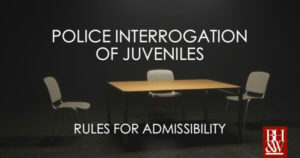 The rules for making a juvenile’s custodial interrogation oral statement admissible in court are enumerated in Texas Family Code Section 51.095(a)(5). The statement must be recorded by an electronic recording device by an operator who is competent to use the device. All voices on the recording must be identified. The recording device must be capable of making an accurate recording. The recording of the child’s statement must be accurate and unaltered. Before the child gives the statement, the recording must show the magistrate giving the juvenile his warnings and the juvenile must waive each right on the recording. The magistrate may request that the police officer, after the interrogation is finished, bring the child and the recording back to the magistrate so the magistrate can review the recording with the child to ensure the statement was voluntarily given. Texas Family Code Section 51.095(a)(2)-(4) lays out the exceptions to the requirements for oral statements made while a juvenile is the subject of custodial interrogation. If any of these exceptions applies, then the special rules for oral statements listed above do not have to be complied with. These exceptions are: statements of fact made by the juvenile which are found to be true and tend to establish his guilt, res gestae statements, and statements made in open court or before a grand jury. The juvenile system in Texas is intentionally separate and distinct from the adult criminal system in order to prevent treating children as if they are miniature criminals. Likewise, there are special rules that apply in some circumstances when a police officer takes a statement from a juvenile suspect. 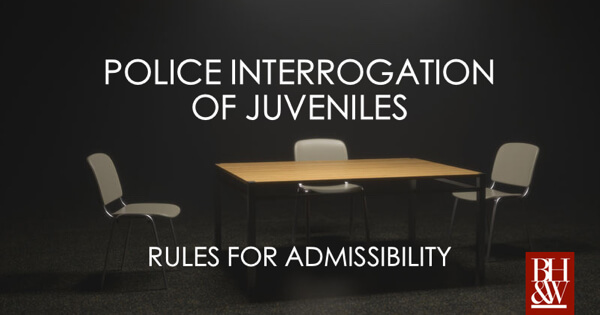 If a juvenile gives a statement without being the subject of custodial interrogation, then the courts will look at the totality of the circumstances to determine if that statement was given voluntarily. If so, then it will be admissible in court against the juvenile. If, however, the child was in custody and subject to interrogation, then these special rules must be followed in order for the statement to be admissible. These rules involve taking the child before a magistrate to be informed of his rights as opposed to being warned by the police officer. If these rules are violated, then the statement will be deemed to be inadmissible. Many people have the perception that the juvenile system is simply a slap on the wrist for kids, regardless of the offense. The reason for this belief is the fact that most kids in the juvenile system get probation. But, probation is not always that simple or easy. 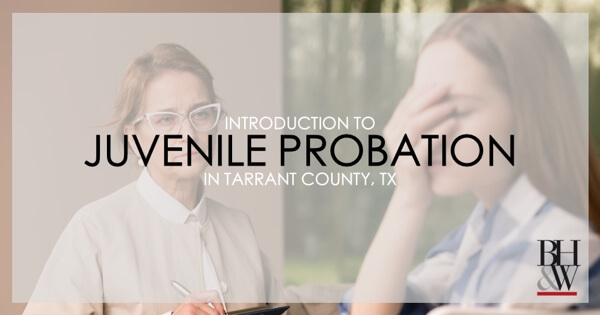 This is an introduction to juvenile probation in Tarrant County. This article will cover the reasons behind the tendency towards probation, the length and parameters of probation and what it can include. According to Section 51.01 of the Texas Family Code, the purposes of the juvenile justice system are to protect the public, promote the concept of punishment for criminal acts, to remove the taint of criminality from children, and to provide treatment, training, and rehabilitation that emphasizes accountability for the parent and child for the child’s conduct. This section goes on to state that a child should be removed from his parents only when it is necessary for the welfare of the child or the interest of the public safety. Section 51.01 forms the foundation for which the entire juvenile justice system is based on. Because of this mandate in Section 51.01 that children should only be removed when necessary, probation with the child remaining in the home is the primary mode of punishment and rehabilitation used by the Tarrant County Juvenile Services Department. The system is not geared towards ripping a kid away from his family, but is built to address and correct the behavior by working with the child and the family together. In the adult system, a person is only eligible for probation on their first felony offense. 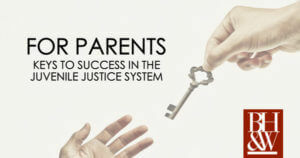 In the juvenile system, however, probation is the preferred outcome on cases due to the Family Code’s preference for keeping children in the care of their parents. Under the provisions of the Family Code, a juvenile is eligible for probation on any offense, up to and including murder. For misdemeanor offenses, probation is the only option available. The maximum length of probation, regardless of offense, is generally up to a child’s 18th birthday. In circumstances involving the most serious offenses or habitual offenders, the prosecutor may seek a determinate sentence which extends the possible punishment. On determinate sentence cases, probation can last for a maximum of ten years. In Tarrant County, prosecutors generally only seek determinate sentences in the most serious of cases. 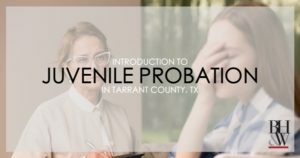 Juvenile probation in Tarrant County can include a wide variety of conditions and requirements, depending on the case and the unique needs of the child and family. Some of the more common conditions of probation are discussed here. The juvenile justice system is a hybrid system. Juvenile proceedings are technically civil in nature, but they incorporate many elements from the criminal system. The reason for this separate system is to teach children that they will be held responsible for their actions without labeling them as criminals. The differences between adult and juvenile trials is a direct result of this difference in systems. 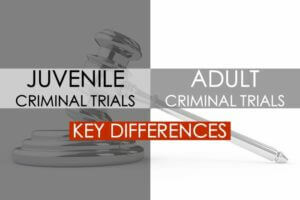 One of the most noticeable distinctions between adult and juvenile trials is in terminology. Juveniles accused of crimes are called respondents, not defendants. Juries do not decide whether a respondent is guilty. Instead, they decide whether it is true or not true that he engaged in delinquent conduct. 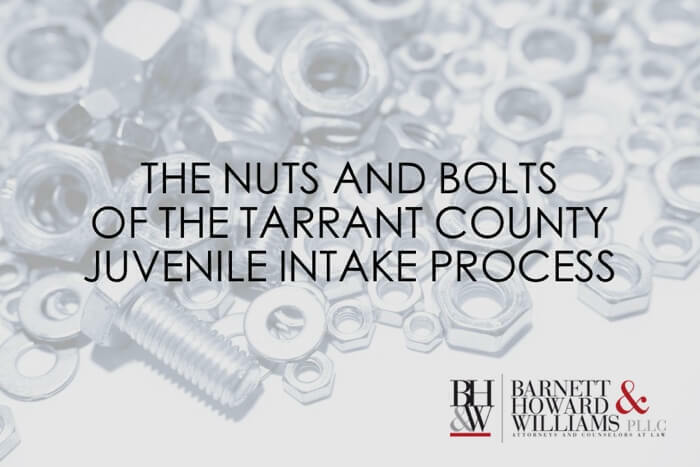 In Tarrant County, the participants that you will see sitting in the courtroom during a juvenile trial are not the same as in an adult case. In addition to the judge, prosecutor, defense attorney, juvenile, court reporter, and jury, there are a couple other participants in juvenile cases. A parent or guardian of the respondent is required to be present during all proceedings. The Tarrant County juvenile judge also requires an intake probation officer to be present anytime the juvenile is in court. For the most part, the procedures in an adult trial and a juvenile trial in Tarrant County are similar. The same rules of evidence apply. A juvenile respondent has the same rights during a trial as an adult defendant has. The trials in the two systems follow the same general order, as well. There are a few significant differences, however. First, and probably most important, is the contrast in who makes punishment decisions in the trials. In adult cases, a defendant can choose whether a judge or jury determines punishment. However, in juvenile cases, a respondent only has this choice in determinate sentence cases. In all other cases, a judge will determine the punishment, if any. Another difference is the judge’s charge to the jury. The jury charge in a juvenile case is a civil charge with criminal language included in it. It is typically longer than a standard criminal charge in an adult case. The jury’s verdict form is also a bit different. In adult cases, the verdict form asks the jury to write guilty or not guilty. In juvenile trials, as mentioned earlier, the jury determines true or not true that the respondent engaged in delinquent conduct. In adult criminal trials, if a defendant is found guilty, the case moves into the punishment phase. In juvenile cases, that next phase is called the dispositional hearing. This is another area in which a juvenile trial differs from adult trials in Tarrant County. If the jury is assessing punishment in an adult case, it generally happens almost immediately after a verdict of guilty is returned. If the defendant chooses the judge to assess punishment, the hearing is usually scheduled for a later date. In the juvenile justice system, most of the time, the respondent does not get to choose who determines disposition. The judge will make the vast majority of these disposition decisions. This means that the dispositional hearing will usually be held a few weeks after the trial. Unlike in adult cases, a social history report on the respondent must be prepared by the intake probation officer prior to the dispositional hearing taking place. This report will be considered by the judge in assessing the appropriate disposition. The last big discrepancy between adult and juvenile cases has to do with the practical effect that these cases have on the person accused. The juvenile system emphasizes rehabilitation instead of punishment. Therefore, juvenile dispositions do not have the same long-term ramifications that adult punishments have. Typically, they are limited in length due to the age limits imposed by the system. In Tarrant County, the juvenile judge will consider probation in each case in which it is appropriate to consider. 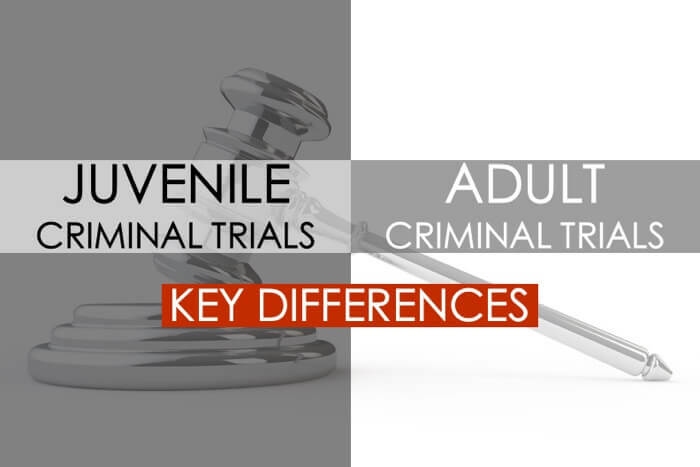 There are a lot of differences between adult and juvenile trials. The main reason for this is because these trials are part of two separate and distinct systems. The juvenile system is a hybrid, combining parts of the civil and criminal systems into one. While there are many similarities between the two, this article highlights the main distinctions between the two. Christy Dunn is a writer and attorney licensed to practice in Texas. She was a prosecutor for 15 years. The last five years of her prosecutorial career was spent in the Juvenile Division of the Tarrant County District Attorney’s Office. She has tried over 20 juvenile cases in Texas and multiple certification hearings. Texas Juvenile Law: What is Determinate Sentencing? In the Texas juvenile justice system, a juvenile court has jurisdiction over a youthful offender if he or she is under the age of 17 at the time an offense is committed. The punishment for an offense typically can only last until a juvenile’s 19th birthday. We are often asked, “What happens if the juvenile is convicted of a serious offense? Is it possible for the court to impose a sentence that extends beyond the juvenile’s 19th birthday?” That is where Determinate Sentencing comes in. This post explains what Determinate Sentencing means and how it can impact a juvenile case. 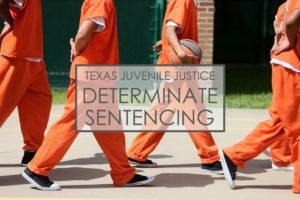 What is Determinate Sentencing in Texas Juvenile Law? Determinate sentencing creates a hybrid system whereby juveniles who have been adjudicated for severe criminal offenses are given a sentence that begins in the Texas Juvenile Justice Department (“TJJD”) and can potentially be transferred to the Texas Department of Criminal Justice (“TDCJ”) for a term of up to forty years. Who requests a Determinate Sentence? The prosecution has sole discretion as to whether to seek a determinate sentence. If the prosecutor decides to pursue a determinate sentence, he or she must file a petition indicating a child engaged in delinquent conduct with the court. Then, the prosecutor must present that petition to the grand jury for approval. If the petition is approved, then it becomes a determinate sentence case. However, if the petition is denied by the grand jury, the State’s only recourse would be to pursue the case as normal. If a juvenile is adjudicated of a determinate sentence, then the judge or jury can assess an appropriate disposition, or punishment, in accordance with the determinate sentence range of punishment. This range is up to 40 years for a capital felony, first degree felony or an aggravated controlled substance felony, up to 20 years for a second degree felony, and up to 10 years for a third degree felony. Misdemeanors and state jail felonies are not eligible for determinate sentence under the Determinate Sentence Act. Once the prosecutor’s request for a determinate sentence has been granted by the grand jury, he or she retains the power to later waive determinate sentencing so long as this occurs before the juvenile has been adjudicated. This often occurs in the course of plea negotiations, when the prosecutor offers an indeterminate sentence in exchange for the juvenile’s acceptance of the plea. For indeterminate disposition, only the judge may assess punishment. However, for determinate sentence cases, the juvenile may choose either the judge or jury to assess disposition. If the juvenile would like the jury to decide punishment, he or she must file a written request with the judge prior to voir dire. To what offenses can Determinate Sentencing apply? intoxication manslaughter, and criminal conspiracy. What is the impact of a Determinate Sentence? 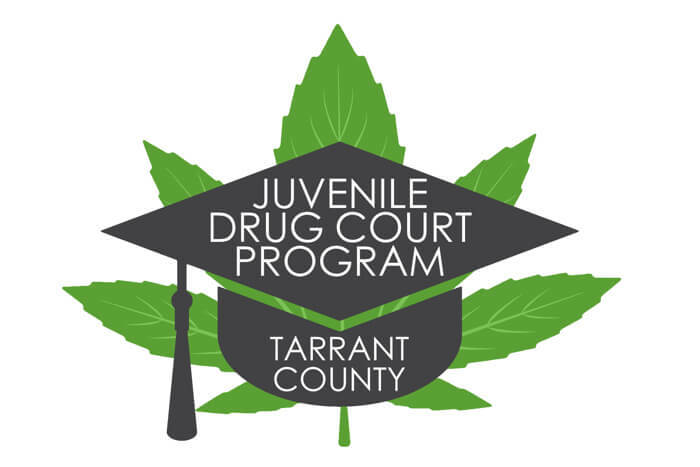 A juvenile who has been adjudicated of a determinate sentence will either be sentenced to placement in the TJJD or placed on probation. In each case, the juvenile court retains jurisdiction over the juvenile up until the juvenile turns eighteen or nineteen. For crimes committed before September 1, 2011, the juvenile remains in the juvenile system until his or her eighteenth birthday. Juveniles who receive probation can be on probation for up to 10 years, which may extend past the time the juvenile reaches adulthood. 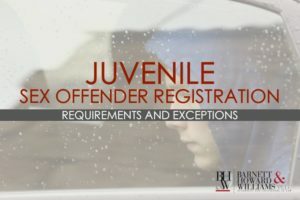 When a juvenile on determinate sentence probation ages out of the juvenile system, the probation automatically expires unless the prosecutor requests a transfer hearing prior to the juvenile’s nineteenth birthday. If a transfer hearing is requested and held, the juvenile judge will decide whether to transfer the juvenile into the custody of an adult criminal court. If the request for transfer is granted, the county’s adult probation department would supervise the juvenile for the remainder of his or her probation. The alternative to probation is for a juvenile to be sentenced to TJJD with the possibility of transfer to TDCJ. In this situation, the judge or jury imposes a sentence of a set number of years that may extend past the age of adulthood. 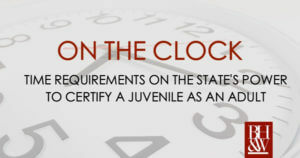 A juvenile is required to complete a minimum length of stay at TJJD. Once he or she has completed that minimum length of stay, TJJD can parole the juvenile, if they choose. For those juveniles who are unable to complete their minimum length of stay prior to aging out of the juvenile system or who are not participating in TJJD programs or progressing satisfactorily towards rehabilitation, TJJD can request a transfer hearing. The transfer hearing, if requested, must be heard by the original juvenile judge who heard the case and it must take place prior to the juvenile’s 19th birthday. After hearing evidence at the hearing, the judge will then decide whether the youth should be transferred to adult prison to complete his or her sentence or whether the youth can be safely released on parole without putting the public safety at risk. 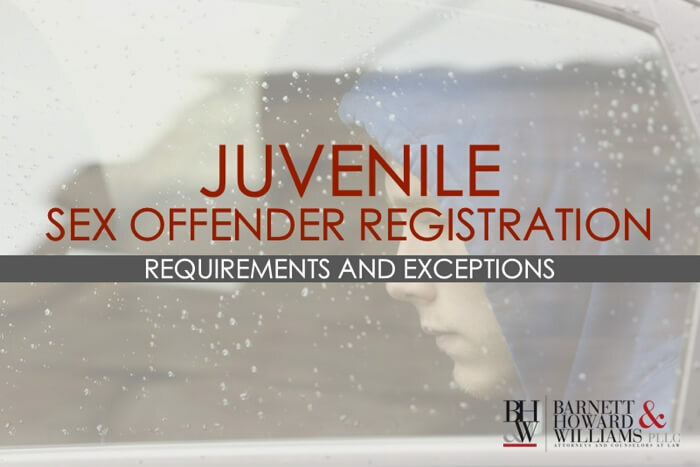 Contact the Texas juvenile defense attorneys at Barnett Howard & Williams PLLC for a FREE consultation of your juvenile case. It is best to contact an attorney at the outset of a juvenile case. Do not wait until after you have attended a meeting with the district attorney. Call today! Are there any options for my child short of going to court? Many parents ask this question after finding out that their child has been referred to the juvenile system. For a lot of kids who are in trouble for the first time, there is a great option available: Deferred Prosecution Program (DPP). In Tarrant County, DPP is used quite often. This article will answer all of your questions about DPP. 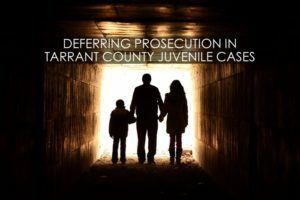 What is Tarrant County’s Juvenile DPP? DPP is a form of informal probation. The juvenile is supervised by a probation officer and has conditions of supervision to abide by during the period of DPP. But unlike formal probation, DPP does not require court action. 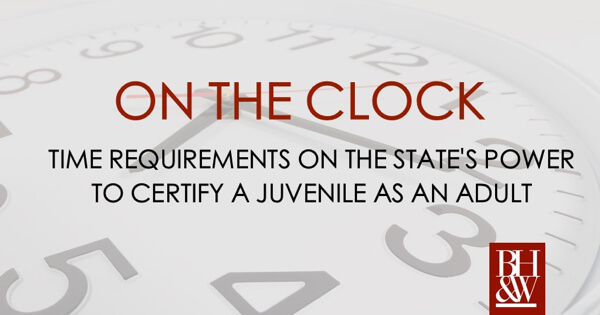 How long does the Juvenile Deferred Prosecution Program last? DPP can, initially, be up to 6 months in length. Most of the time in Tarrant County, a juvenile will receive a 6-month term. Under the provisions of the Texas Family Code, DPP can be extended for an additional 6 months if necessary. However, DPP cannot last longer than 12 months total. What types of cases are eligible for DPP in Tarrant County? DPP can be offered in any case, regardless of the offense. Whether DPP is appropriate for a given juvenile depends more on the kid’s prior history with the legal system and the facts of the case than it does with what the offense is. However, a child has a better chance of receiving DPP in a misdemeanor or a minor felony case than for a serious felony. At what point in the process can DPP be offered to a juvenile? In Tarrant County, there are four points in the process where DPP can be offered to a juvenile. The first of these is by the intake probation officer during the intake process. Many times, if the case is appropriate for DPP, the probation officer will offer it during the intake appointment. This is one of many reasons why it is important for the family to attend the intake appointment with the probation officer. If DPP is accepted, then the juvenile will begin supervision and the case will not be referred to the prosecutor. The second point where DPP can be offered is after the case is referred to the District Attorney. Once the prosecutor has reviewed the case, she can decide to offer DPP. If it is accepted at this point, the case is sent back to the juvenile probation department and supervision will begin. The prosecutor can also offer DPP after the case is filed and before it goes to court. If this happens, then the charges are dismissed and DPP supervision begins. The last opportunity for a DPP offer is in court. In Tarrant County, this is rare, and only happens if the probation officer and prosecutor both refuse to offer DPP. At court, prior to any evidence being heard, the juvenile and his attorney can ask the judge to give DPP. The judge has discretion to grant the DPP or not. Are charges still filed in a juvenile DPP case? Typically, charges are not filed in a DPP case. If the DPP is agreed upon after charges have been filed, the charges are, at that point, dismissed. What are the typical conditions of supervision? The conditions of supervision on DPP are generally the same as for probation. These include go to school, don’t commit crimes, and obey the curfew set by the parents. In some cases, the conditions may also include appropriate counseling or restitution. 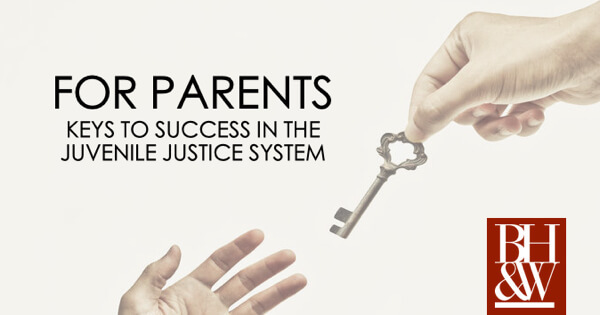 What happens if the juvenile is not successful in completing DPP? If a juvenile who is on DPP violates the terms of his supervision, the case could be reopened and reviewed. If the original DPP was given by the probation officer, then the case will be sent to the prosecutor upon violation. At that point, the charges can be filed or the prosecutor can offer a second term of DPP. If the original DPP was given by the prosecutor, then upon violation the charges can be filed and the case can go to court. The judge can give a second term of DPP at this point if he chooses. What happens if DPP is successful? If the juvenile is successful on DPP, then the case is closed out with no adjudication on the juvenile’s record. The juvenile may be able to his record sealed after a period of time. DPP is a wonderful option that is available to juveniles who have never been in trouble before or who are referred for minor offenses. It is up to 6 months of informal probation. If the child is successful on DPP, then the case will be closed and no charges will ever be filed. DPP is an alternative to going to court and being on formal probation. For many kids, this will be a great opportunity to handle their case in a very favorable manner. If DPP is offered, it is worth considering and discussing it with your attorney. In Tarrant County, the Juvenile Probation Department is the intake agency for the county. This means that when a police officer files a case against a juvenile, it goes to Juvenile Probation before being sent to the District Attorney’s Office. The common practice is for cases to be referred by law enforcement officers without making an arrest. When this happens, there is a specific process in place with certain tasks that the juvenile intake officers must perform before a case is referred to the prosecutor. This article will walk you through this often-misunderstood process and explain why those juvenile probation officers do what they do. When a case is first received by the Tarrant County Juvenile Probation Department, it is assigned to an intake unit. There are three intake units within the department. Once it is received by the intake unit supervisor, it is assigned to a court intake officer. The court intake officer is responsible for completing several tasks prior to court, including: conducting an intake appointment, administering assessments, making sure the juvenile is fingerprinted and photographed, and preparing a social history. The intake officer must also make a decision about what the next step in the process should be. The intake appointment is, arguably, the most important piece of the intake process in Tarrant County. It is also the part that is the most confusing to families and defense attorneys alike. While families and attorneys can, and do, refuse to participate in the intake appointment, nothing good comes from refusing. To the contrary, in some cases, cooperating with the probation officer by showing up for the intake appointment can help resolve the case without a referral to the prosecutor or court action. The defense attorney can be at the intake appointment if he wishes, but is not required to be. During the intake appointment, the probation officer will explain the process to the juvenile and his family. They will also explain the charges and sometimes read a summary of the police report. They are not allowed to give a copy of the police report to the family. The intake officers do not ask the juvenile about the offense. Next, the officer will get some background information from the family. This information will include a family history, school history, and information on any other agencies that the family has been involved with. The officer will also ask about substance abuse, mental health, any prior hospitalizations, current and past medications, behavior at school and home, and family criminal history. The purpose in gathering all this information is to put together a social history, which is a comprehensive report, on the child that will guide the court and the attorneys involved when making decisions about the juvenile and the case. During the intake appointment, the probation officer will also administer a couple of assessments to the juvenile. These are required, but the defense attorney can decline the assessments. The two assessments, which are given are called the PACT and the MAYSI. The purpose of the PACT assessment is to determine the child’s risks to reoffend and needs for services. The results of the PACT assessment are included in the social history that is given to the court and attorneys. The MAYSI is designed to screen for problems with mental health, substance abuse, and/or suicide. If the results of the MAYSI show a concern for suicide, a no-harm contract will be completed with the child, and the officer will refer that child for services to help with the suicidal tendencies. The Texas Department of Public Safety (DPS) requires anyone who is charged with a crime, juvenile or adult, to be fingerprinted and photographed. This information is submitted to DPS and is included in the person’s juvenile or criminal history. When a person is arrested, these two things are done as a part of the book in process. However, when a juvenile case is referred to the Tarrant County Juvenile Probation Department without an arrest, the probation officer is required to get the fingerprinting and photographing done. This is usually done during the intake appointment. It entails the officer walking the child to the juvenile detention center where the fingerprint and photograph office is located and having it done. This is one part of the process, which cannot be waived or refused. It is required by the State of Texas in every case. The last aspect of the intake process is for the probation officer to make a probable cause determination on the case and decide what to do with the case. There are certain offenses that are considered “mandatory referrals” in Tarrant County. This means that the probation officer is required to refer the case to the prosecutor for review. The mandatory referral offenses are the more serious offenses and are usually felonies. For offenses that are not mandatory referrals, the probation officer is responsible for making a decision about what to do with the case. The officer can, of course, refer a case to the prosecutor for review even if it is not a mandatory referral. However, they have other choices too. They can dismiss a case or offer the juvenile Deferred Prosecution Program (DPP), which is an informal probation period without charges being filed. In some cases, the officer may determine that if the child pays restitution, then the case can be closed out without any further action. If the child and family does not cooperate with the intake process, the officer is required to refer the case to the prosecutor. However, if the family does participate, they may find that they can take care of their case during the meeting with the intake officer, which is definitely to the child’s benefit. Additionally, the officer may, and many times will, make referrals for services to the family based on their needs. These referrals could be for any number of resources available in the community. They could include referrals to MHMR, school programs, and counseling, to name a few. 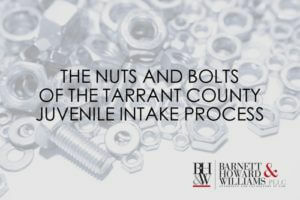 The Tarrant County Juvenile Probation Department’s intake process is misunderstood many times by families and attorneys. It is not an adversarial process. The intake officers are neutral parties charged with gathering information, preparing social history reports, and making referrals for services. They are required by law to perform a few tasks, such as fingerprinting. However, their primary purpose is to help the child and the family navigate a system which may be unfamiliar and confusing. If you and your child are contacted about meeting with an officer for an intake appointment, it is preferable for you to cooperate so that you may have access to all possible options in your child’s case.